Reuters faking photos of Israeli "war atrocities"
At least one instance of obvious fakery of war photos in Lebanon has been admitted by Reuters news agency after some dogged work by bloggers (see Little Green Footballs and Reconcilable Differences) . It’s so incredibly obvious, it reminds me of the faked CBS memos. Smoke simply does not contain repeating symmetrical patterns like this, and you can see the repetition in both plumes of smoke. There’s really no question about it. This photo was "pulled" and is no longer visible. It used to be here: http://news.yahoo.com/photo/060805/ids_photos_ts/r3101797657.jpg until Yahoo caught up. What buildings were flattened? What was in them?? What were they used for? Is smoke billowing from any flattened buildings? The text is as faked as the photo, but Reuters doesn't care. All the smoke seems to be coming from a single area at the left. No buildings were flattened in the smoky area. Some seem to be flattened in the foreground, possibly from an earlier bombing. The right corner of the AP photo corresponds to the left side of the Reuters photo. "Extra" buildings are clearly visible in the first Reuters photo, as the Little Green Footballs animation shows, but are they also there in the "real" Reuters photo, or is that too a fake? At the very least, the camera was stopped down to darken the photo and dramatize the smoke. Yes, this is the same guy who did many of the ubiquitous Mr T-Shirt photos featured here and elsewhere earlier. A Reuters employee has been suspended after sending a death threat to an American blogger. The message, sent from a Reuters internet account, read: "I look forward to the day when you pigs get your throats cut." It was sent to Charles Johnson, owner of the Little Green Footballs (LGF) weblog, a popular site which often backs Israel and highlights jihadist terrorist activities. OK, now are you ready to believe the media just might not be covering this war fairly? 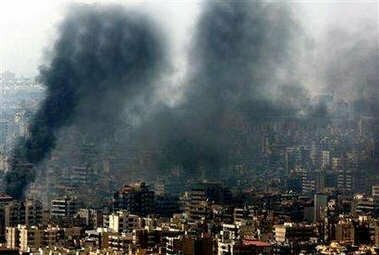 A Reuters photograph of smoke rising from buildings in Beirut has been withdrawn after coming under attack by American web logs. The blogs accused Reuters of distorting the photograph to include more smoke and damage. 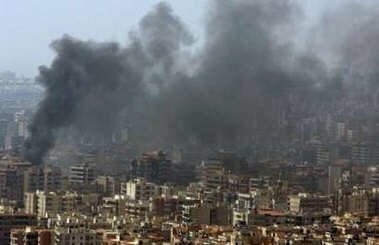 The photograph showed two very heavy plumes of black smoke billowing from buildings in Beirut after an Air Force attack on the Lebanese capital. Reuters has since withdrawn the photograph from its website, along a message admitting that the image was distorted, and an apology to editors. In the message, Reuters said that "photo editing software was improperly used on this image. A corrected version will immediately follow this advisory. We are sorry for any inconvience." 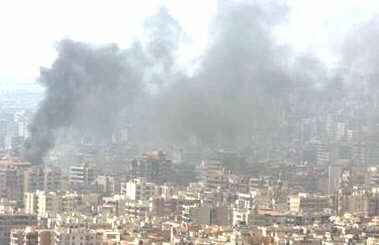 Reuters' head of PR Moira Whittle said in response: "Reuters has suspended a photographer until investigations are completed into changes made to a photograph showing smoke billowing from buildings following an air strike on Beirut. Reuters takes such matters extremely seriously as it is strictly against company editorial policy to alter pictures." "As soon as the allegation came to light, the photograph, filed on Saturday 5 August, was removed from the file and a replacement, showing the same scene, was sent. The explanation for the removal was the improper use of photo-editing software," she added. Earlier, Charles Johnson, of the Little Green Footballs blog , which has exposed a previous attempt at fraud by a major American news corporation, wrote : "This Reuters photograph shows blatant evidence of manipulation. Notice the repeating patterns in the smoke; this is almost certainly caused by using the Photoshop "clone" tool to add more smoke to the image." Johnson added: "Smoke simply does not contain repeating symmetrical patterns like this, and you can see the repetition in both plumes of smoke. There's really no question about it." A series of close ups are then posted on the blog, showing that "it's not only the plumes of smoke that were 'enhanced.' There are also cloned buildings." The close ups do appear to show exact replicas of buildings appearing next to one another in the photograph. The Sports Shooter web forum , used by professional photographers, also examined the photo, with many users concluding that the image has been doctored. "I'll second the cloned smoke...but it looks so obvious that I don't know how the photographer could have gotten away with it," wrote one user. After further research, Johnson posted a photograph he says is the original image taken before distortions were made, showing much lighter smoke rising. Other blogs have also analyzed the photographs, and reached similar conclusions, such as Left & Right , which states: "The photo has been doctored, quite badly." The author of the Ace of Spades blog wrote: "Even I can see the very suspicious "clonings" of picture elements here. And I'm an idiot." The Hot Air blog also looked at the photo, describing the image as "the worst Photoshop I have ever seen." Adnan Hajj, the photographer who sent the altered image, was also the Reuters photographer behind many of the images from Qana - which have also been the subject of suspicions for being staged. In the threat, the Reuters staff member, who has not been named, left his email address as "zionistpig" at hotmail.com. Reporting the message to his readers, Johnson wrote on his website: "This particular death threat is a bit different from the run of the mill hate mail we get around here, because an IP lookup on the sender reveals that he/she/it was using an account at none other than Reuters News." Speaking to Ynetnews, Johnson said: "I was surprised to receive a threat from a Reuters IP, but only because it was so careless of this person to use a traceable work account to do it." He added: "I think it's more than fair to say that Reuters has a big problem." After bringing the threat to the attention of Reuters, Johnson was told by the news organization's Global Head of Communications, Ed Williams: "I can confirm that an employee has been suspended pending further investigation. The individual was not an employee of Reuters' news division." In an additional twist, Johnson traced the movements of the sender of the threat, and found direct parallels between the internet locations of the sender and Inayat Bunglawala, Media Secretary of the Muslim Council of Britain. Bunglawala, who contirbuted an editorial to the Guardian website, has attracted negative attention in the past after making anti-Semitic outbursts, and has declared that the British media was "Zionist-controlled." In the comment section of the Guardian, underneath his own editorial, Bunglawala denied sending the threat, blaming "Zionists" instead. "That was not me! Methinks some Zionists are up to mischief," he wrote. "There is strong circumstantial evidence connecting Bunglawala to the threat, but there is no way for me to verify this for certain. Only a Reuters network administrator would have access to the necessary records," Johnson said. Original content is Copyright by the author 2006. Posted at ZioNation-Zionism and Israel Web Log, http://www.zionism-israel.com/log/archives/00000202.html where your intelligent and constructive comments are welcome. Disributed by ZNN list. Subscribe by sending a message to ZNN-subscribe@yahoogroups.com. Please forward by e-mail with this notice, cite this article and link to it. Other uses by permission only. Home » Archives » August 2006 » Reuters faking photos of Israeli "war atrocities"